Here's the full rundown on the 2012 Detroit Auto Show - it was a good one. There you have it folks, Detroit 2012. It's been one of the best and most optimistic Detroit shows in years. Full articles and image galleries linked from the left as ever. One of the most talked about cars of the show was the Acura NSX concept. Acura is Honda's North American luxury/sports division and so it got to show off the new car on its stand. Fear not, it'll be sold as the Honda NSX when it eventually reaches the showroom - by 2014 we reckon. Looks like it'll have about 400bhp from its hybrid powertrain and four-wheel drive. The Acura RDX SUV and ILX saloon also on the stand were all but ignored. Given the company's recent new product onslaught it was a little surprising that the only all-new exhibit on Audi's stand was the Q3 Vail concept, though there are loads of US market debuts. The Vail is a winter sports themed Q3, powered by a promising 309bhp five-cylinder engine. Big news on the Bentley stand in Detroit was the arrival of a new twin-turbo V8 engine to the Continental GT and GTC line-ups. It's an advanced unit boasting 500bhp and 442lb.ft of torque, cylinder deactivation technology and a 500-mile cruising range. Just don't call it the 'cheap' version. Detroit was, we think, the first outing for the new BMW 3 Series, but seeing as we've already driven it, it didn't grab our attention. The news that a BMW M5 with a manual gearbox would be sold did though, mainly because it won't be offered over here. Eh? Ordinarily we wouldn't pay that much attention to an announcement from Buick, as the cars built by GM's luxury brand never make it this side of the pond. However, if you prise the badges off its compact SUV - the Encore - you get Vauxhall's rival for the Nissan Juke, called the Mokka. Your compact executive saloon isn't worthy of the tag if you don't compare it to the BMW 3 Series, which is exactly what Cadillac is doing with its new ATS, despite the distinctly Mercedes-like styling. The Caddie features rear-wheel drive and will probably be made in right-hand drive. We knew that Chevrolet would unveil the Aveo RS baby hot hatch, but it surprised us with a weirdly named concept coupé double act. The Tru 140S and Code 130R were apparently conceived with Generation Y in mind. They're interesting if nothing else. The big reveal by the Chrysler Group at Detroit was the Dodge-branded Dart saloon but the 700C concept parked at the other end of the stand has garnered almost as much attention. This is primarily because Chrysler has released no information about it at all other than it was brought along to 'gauge interest' from press and public alike. We would not be surprised if it eventually morphs into a replacement for the venerable Grand Voyager. The idea of taking a car like the Alfa Romeo Giulietta, throwing away its good Italian looks and re-skinning it with something sporty and American might sound odd, but it works in this instance. That's how the Dodge Dart came along and it really does look good. Will be sold with MultiAir engines too, though probably not in the UK. Another car we are unlikely to see over here is the 590hp Dodge Charger Redline. Shame that! We knew something Evos-inspired was coming to Detroit, but we didn't quite expect a production ready saloon (the Fusion) that clearly previews an all-new Mondeo. Don't expect Energi (electric) and Hybrid versions of the Mondeo, but it should look this good when it arrives in 2013. As predicted, Hyundai launched its new Veloster Turbo in Detroit. A modest update to the already quite eye-catching styling differentiates it from the lesser model, as does a nigh-on 200bhp engine. We're hoping for some suspension revisions too. 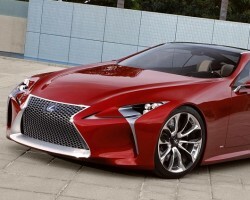 For us, the battle of the Japanese hybrid supercar concepts was won by the Lexus LF-FC. Where the Honda NSX looks almost production ready (and dare we say it, a little tame), the Lexus is wonderfully OTT. Still, it looks like it'll influence a new production car down the line. Mini Lexus LFA anyone? Just don't expect a screaming V10 under the bonnet. Detroit was the first chance for our American cousins to see the upcoming Maserati SUV that was originally unveiled at Frankfurt. Little has changed since then but Fiat boss Sergio Marchionne did confirm that when it enters production it will be Ferrari engined, built in Detroit and will carry an Italian name that is "more beautiful than Kubang". To mark its 50th anniversary, the new Mercedes-Benz SL was launched in Detroit, though arguably the restored 1952 example stole the show. Alongside them the worthy (but let's face it, dull) pair of E-Class hybrids melted into the background. We've known about the MINI Roadster for so long that its actual world debut was a bit of an anti-climax in Detroit. Still, we're looking forward to driving it. Just not in Detroit in winter. Brrr. There's one word that describes Porsche's new 911 Cabriolet: 'predictable'. We also predict that it'll be brilliant as ever. It took its first bow in Detroit. Toyota's American yoof brand used the Detroit show to unveil its version of the GT 86/BRZ rear-drive coupé. Having already seen the Toyota and Subaru versions this didn't excite us. What did excite us was the 600hp version that was built by Scion and GReddy for Ken Gushi to compete with in Formula DRIFT. It's a real sign of the times when a tiny (and we mean really tiny) electric pick-up truck grabs a few headlines in the motoring heartland of America. This is the funky little Smart for-us concept. Not quite sure what it means to the company's future product line, but who cares, right? Toyota chose to follow the single-shot teaser release that worked so well on the Lexus LF-LC to announce the NS4 Plug-In Hybrid Concept to the world and this got the blogosphere excited about a possible Supra replacement. What we actually got looks to be the next generation Prius packed to the rafters with human-machine interface technology. Two cars starred on the VW stand, neither of which we're going to be given the chance to buy. The Jetta Hybrid is for pro-petrol countries while our hopes for a Beetle coupé based on the cool E-Bugster electric concept were quickly dashed by Volkswagen. The Swedish company previewed its new XC60 Plug-in Hybrid in Detroit. It mates a petrol engine with an electric motor and battery that you can charge by plugging it in, giving it great on-paper economy. It is unlikely to be sold in right-hand drive markets however.